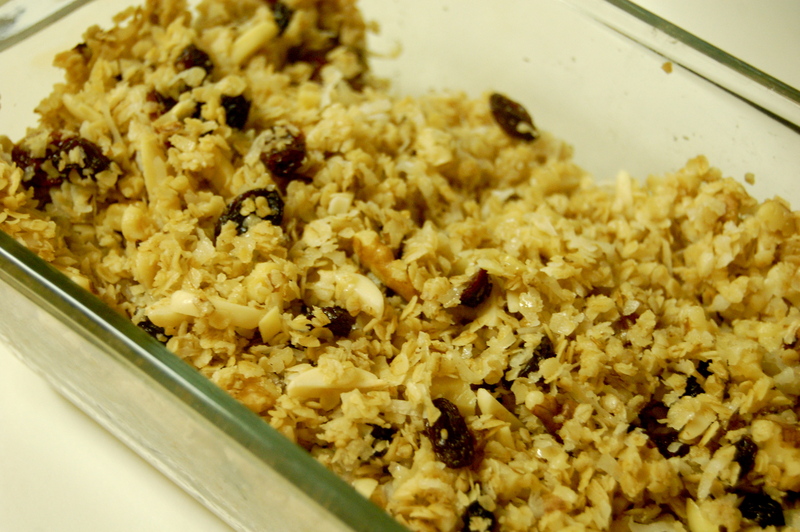 I have great memories of a time one or two years ago when two of my friends and I got the urge to make homemade granola. After a “quick” Whole Foods run, a pecan-chopping adventure (involving two cans, a bowl and some saran wrap) and a lot of taste-testing, we ended up with some of the best granola I’ve ever eaten. This all occurred in Tram’s kitchen with my two favorite journalism students. I got the taste for homemade granola last week, so I worked it into my grocery budget. The main ingredient (rolled oats, aka oatmeal) is incredibly cheap, but I had to dance around some prices for the nuts (a necessity). I had about a cup of slivered almonds in my pantry, so I just needed to buy a bag of walnuts. I had everything else on hand in my pantry. As with everything else, I worked with what I had and ended up with my own version of a granola recipe. I’m currently munching on still-warm oatmeal mixed with unsweetened plain yogurt, and it’s delicious. Add wet ingredients to the mixture. Hint: If you use the same cup to measure the honey that you already measured the oil with, the honey will come right out! Mix well. Place 1-2 inches thick in cake or loaf pans and bake. Gently mix approximately every six minutes. Take it out when it’s a light golden color. Don’t overcook! I was JUST thinking of our granola yesterday! I’ve been trying to come up with a granola BAR recipe. That’s why those fond memories came up. Yum, let me know whenever you come up with a recipe!